Death Stranding is a PS4 game, but according to Mark Cerny's enigmatic smile it may also be a PS5 game. That's according to a new Wired report that officially confirmed the next-gen console is coming (Sony even tweeted about it, so you know it's not just another dubious leak). While system architect Mark Cerny stayed away from the topic of new games for the console, focusing instead on specs, capabilities, and how things like a built-in solid-state drive will cut load times, Wired asked him if the new system would also be a platform for Death Stranding. "Where exactly Hideo Kojima’s forthcoming title Death Stranding fits in that process is still unconfirmed. When asked, a spokesperson in the room repeated that the game would be released for PS4, but Cerny’s smile and pregnant pause invites speculation that it will in fact be a two-platform release." If you're wondering, yes, Mark Cerny is in a place to know about these things - on top of being hardware honcho for both PS4 and PS5, he's been a major mover and shaker at PlayStation from almost the beginning. So the fact that he gave a knowing smile to a question that could have easily been answered with, "No, Death Stranding remains a PS4 exclusive," speaks volumes. Like the Mona Lisa's smile but about video game release plans. As a refresher, Death Stranding was first announced at E3 2016, the first new title to come from Kojima Productions after it broke with former owner/publisher Konami. The most specific the studio or Hideo Kojima himself have gotten about a release date since then was "before the Tokyo Olympic games" which are set for summer 2020. 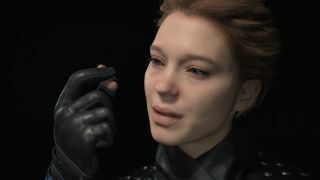 Kojima said earlier this year that production was running "slightly" behind schedule, but not by much. Cerny confirmed in the interview that the new PlayStation won't arrive this year, so that still leaves the window for both of them wide open in 2020. Or beyond. Hopefully not beyond. Take a look through our list of upcoming PS4 games and see if you spot any other likely PS5 contenders. Or get a feel for the week ahead with our latest Release Radar video below.